Do you ever wonder why you can readily solve advanced tactical puzzles in your training sessions – but seldom find such tactics in your own games? If you say yes, then read on! Because in this lesson I will help you understand how to discover interesting tactics that exist in your games. There are 4 areas of skill (in broad terms) that determine how skilled you are at finding advanced tactics. Calculation skill – your ability to identify all the forced variations in the position and accurately determine their outcomes. Visualization skill – your ability to make moves in your mind and clearly see the resulting position in your mind’s eye, without moving the actual pieces on the board. Tactical skill – your awareness of tactical motifs and your ability to create and exploit targets in your opponent’s position. Your ability to integrate the implications of the position’s underlying tactical motifs into your thinking process. This article will focus on the 4th one since it is a subject that is seldom discussed. I’ll use the position below to demonstrate the thinking process that will help you find advanced tactical ideas in your own games. Black just played 1… Qf8. What would you do as white? Let’s start with a quick summary of the situation. White is down one point in material (two pawns for a knight). However, white has sufficient compensation for his material in that his pieces are more active than the black counterparts. The white king is also safer than the black king. 2.Rxf7 Qxf7 3.Qxc5 gets a pawn but releases all the pressure. In such situations you should avoid trading pieces and instead look for ways to increase the pressure against your opponent. Now that we understand the situation better, let’s move on. Your opponent’s last move contains a lot of information. That is why you should understand the reasoning behind it before you start calculating your own candidate moves. What are the consequences of black’s move 1… Qf8? In this case black has no new threats. This means white has a free hand to increase the pressure against black. Also, an important consequence of black’s last move is that white would now be able to play 2.Qd5 (without risking a trade of queens). You will soon see why this is an important observation. 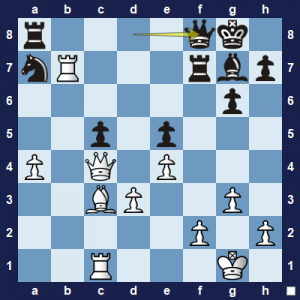 There are a number of hidden tactical motifs in this position that white must discover. If he finds these tactical ideas (and consider their possible implications) then it could help him discover even more tactical ideas. Pin | The rook on f7 is pinned to the king by white’s queen. Once you identify a underlying tactical idea that exist in the position, you should also try to understand it’s implications because that is the key that could unlock more tactical ideas. For example, the fact that black’s f7-rook is pinned also means that your rook on b7 is indirectly defended (black can’t play Rxb7). Furthermore, black’s rook on f7 does not help defend the knight on a7 and black also can’t play Rxf2 at the moment. These implications may or may not be relevant – you wouldn’t know yet. Overloading a Defender | The black queen is an important defender of the rook on f7. Whenever a piece plays an important defensive role, then that piece becomes vulnerable, potentially. If you can create another threat that requires support from black’s queen, then she will become overloaded (more about this when we discuss the solution). White can cause black’s rook on a8 to become a hanging piece. Black’s rook on a8 will be hanging after Rxf7, Qxf7, and as you probably know – a hanging piece is often a target in tactical combinations. Of course this trade does not make sense right away but it could be a part of a grander idea. Black’s rook on a8 essentially can’t move since it defends the knight on a7. Black’s rook on a8 is a potential target because, as we just discussed earlier, any piece that performs a defensive role can become vulnerable when threatened. How can I take advantage of the tactical ideas that exist in the position or how can I increase the pressure against black? The black rook on f7 is pinned. The black queen is an important defender and can potentially be overloaded. We can use the trade Rxf7 Qxf7 to turn the black rook on a8 into a hanging piece. Black’s rook on a8 can’t move since it’s “tied” to the knight on a7. As a consequence of black’s last move, Qd8-f8, white can now play 2.Qd5 without risking a queen-trade. Since the rook on a8 also defends the knight on a7, it can’t simply move away. Ie. 1.Qd5 Rc8 2.Rxa7 again takes advantage of the fact that black’s rook on f7 is pinned. Black has no satisfactory way to defend against this threat. But, before you play 2.Qd5, you should calculate what would happen if black tries to complicate matters by playing 2… Rd8?! How should white deal with black’s idea 2… Rd8?! 2.Qd5 Rd8 3.Rxf7 Rxd5 4.Rxf8+, followed by exd5 also leaves white ahead in material. Once you’ve calculated that black’s aggressive responses, Ie. 2… Rd8 doesn’t work, you can go ahead and play 2.Qd5. 2.Qd5 prepares to play 3.Rxf7 (which would be a discovered attack on black’s a8-rook). You can see how your calculation skill combined with your understanding of tactical motifs can help you find advanced tactics. In our calculation process we usually calculate all the forcing moves in the position (checks, captures and threats). However, some threats are rather subtle and at a first glance they may not appear to be threats. The result is that you overlook certain moves which you should have calculated. When you consider the underlying tactical motifs in the position it can trigger your intuition and help you recognize more candidate moves. It’s all about unearthing ideas that aren’t obvious to the untrained eye. I trust you can now see why it is essential to develop a good understanding of tactical motifs and how it will help you find advanced tactical ideas in your chess games. You must be able to calculate all the forced variations and simultaneously be aware of tactical motifs that exist and their potential impact. You won’t always be able to exploit the underlying tactical ideas in the position but being aware of them (and understanding their possible implications) will dramatically improve your ability to find them when they do exist! Being aware of the underlying tactical ideas in the position (and their possible implications!) can help you discover advanced tactics. From this lesson you will also understand why chess is seen as a science but also as a form of art. Your ability to calculate complicated variations should work together with your intuition and experience on order to help you discover interesting tactics in your games. P.S. I want to make it clear that the steps I discussed in this article are not a “magic pill” that will suddenly turn you into a tactical wizard. The lesson merely illustrates aspects of a thinking process that can help you find tactics in position where they weren’t immediately obvious.